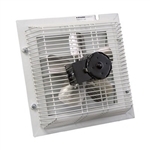 Schaefer SFT-1600 16" Shutter-Style Exhaust Fan, great for greenhouses . Low-maintenance, energy-efficient solution for low to medium airflow. Features an aluminum blade, powder-coated guards, durable PVC shutters and an enclosed heavy-duty motor. Hardwired electrical connection required. Mounts flush to exterior wall. Dimensions: L x W x H 14" x 22" x 22"
Schaefer SFT-2000A 20" Shutter-Style Exhaust Fan, great for greenhouses . Low-maintenance, energy-efficient solution for low to medium airflow. Features an aluminum blade, powder-coated guards, durable aluminum shutters and an enclosed heavy-duty motor. Hardwired electrical connection required. Mounts flush to exterior wall. Dimensions: L x W x H 12 ⅜" x 22 ¾" x 22 ¾"
Brushed aluminium. Automate with shutter motors (requires a thermostat or other controller - not included ) or VEL thermal opener. rough opening: 30 1/2" wide X 31"
Provide air exchanges while excluding light. 20" x 20" x 9-3/4" depth. American made. Excellent performance. Automate any shutter up to 48"